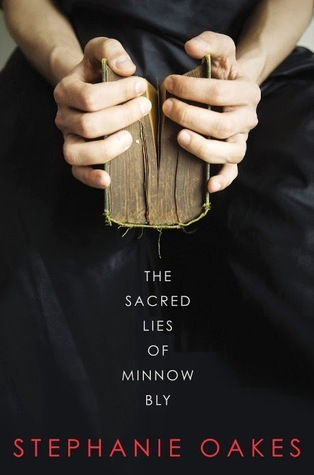 Since she was five years old, Minnow lived with her parents in a cult in the middle of the woods. They called it the Community and their leader was known only as the Prophet. No matter what he asked of them, they unquestionably obeyed. If anyone rebelled, they were punished severely. Minnow rebelled, and they cut off her hands. Now the Community has been destroyed, the Prophet has been killed, and Minnow is in juvenile detention for assaulting, and almost killing, the first person she encountered on the outside. Although it's a punishment, being in juvie is liberating compared to her previous life. Minnow is still adjusting to living without her hands, but she also must adjust to this whole new world full of things like television and candy and scientific facts. In the Community, women and girls weren't even allowed to read, so now she's learning to read for the first time. Her roommate is a tough girl named Angel who is in for murder, and many other kids there are afraid of her, but she and Minnow become friends. Angel is always reading, hungry for knowledge, and obsessed with Carl Sagan. I kind of loved her. But the past isn't entirely behind her. She doesn't seem to care much about what happened to her family, but in the melee that ended the Community, a boy she cared a lot about was killed. Jude wasn't from the Community - he lived out in the woods with his father. They were also cut off from the outside world, but basically just lived in their own private world. She would sneak away to spend time with them, at first as friends when they were kids, but as they got older their relationship became deeper. It was bad enough that she had contact with an outsider, but he and his father were black - the Community called them "Rymanites" and forbid any interaction. In addition to dealing with her loss of the only person she felt really close to, Minnow was regularly visited by Dr. Wilson, who wanted the full story about who killed the Prophet and was convinced that Minnow had the answers. Minnow didn't want to talk about Community or how it ended; she wanted to just live her life. But she wasn't going to be able to move forward without dealing with these parts of her past. Oakes's writing was a pleasure to read. Her turns of phrase were inventive and perfect and often evoked a strong visual image. One passage I liked came after Dr. Wilson gave Minnow a copy of Tess of the D'Urbervilles, which is a bit beyond her reading capabilities. "There's plenty in the book I don't understand, and those parts stay behind, bolted to the pages, but there are things I can skim from the surface like fat from a milk pail, and I sort through all the information with something like fingers, fingers inside my mind." "All around, the rigid trees groaned with human-like voice, their insides frozen in the position they'd held themselves before winter hit. I imagined how it might've gone, one night in November, they were sleeping and suddenly their entire bodies became stuck like steel. And, now, suddenly, I could pick my head up and face the winter sky and glimpse the tops of trees and move my body in any motion I chose." I think my favorite description is one I can't share because it's at the end during a fairly significant reveal. There's so much interesting stuff going on in this book - I haven't even mentioned the secrets in Jude's family - and I'm hoping it will lead to a good discussion at my book group at work next week. (I also hope I don't forget all the details before then!) I think it was someone from the group who suggested it, and I'm glad they did because I hadn't even heard of it. All in all, a great story well told.